How can a woman learn to let go of the people she loves the most? Karen Neulander, a successful New York political consultant and single mother, has always been fiercely protective of her son, Jacob, now six. She’s had to be: when Jacob’s father, Dave, found out Karen was pregnant and made it clear that fatherhood wasn’t in his plans, Karen walked out of the relationship, never telling Dave her intention was to raise their child alone. But now Jake is asking to meet his dad, and with good reason: Karen is dying. When she finally calls her ex, she’s shocked to find Dave ecstatic about the son he never knew he had. First, he can’t meet Jake fast enough, and then he can’t seem to leave him alone. Karen quickly grows anxious as she watches Dave insinuate himself into Jake’s life just as her own strength and hold on Jake grow more tenuous. As she struggles to play out her last days in the “right” way for Jake, Karen wrestles with the knowledge that the only thing she cannot bring herself to do for her son—let his father become a permanent part of his life—is the thing he needs from her the most. 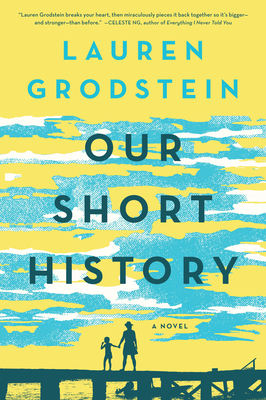 With heart-wrenching poignancy, unexpected wit, and mordant humor, Lauren Grodstein has created an unforgettable story about parenthood, sacrifice, and life itself. "Fans of Wit and Life and Other Near-Death Experiences will love Karen’s unflinchingly honest journey." “Karen is a character many will love—determined, flawed, loving, witty. . . . a poignant and realistic portrait." “A meditation on love and grief . . . Lauded novelist Lauren Grodstein plunges into both beautiful and ugly emotions without hesitation."